Designing for the Dark - “Light where you need it, when you need it, and no more." Flagstaff, Arizona was the first community to be recognized as a "Dark-Sky" community. A great conversation has started in the lighting design industry about keeping light pollution to a minimum. A recent article by Architectural Record outlines new studies about the effects of night time light pollution, not just on humans, but also on other animals and ecosystems. The American Medical Association recently released a statement of warning regarding LED street lights. Another study determined that the Milky Way is invisible to more than one-third of the world’s population, including 60 percent of Europeans and nearly 80 percent of North Americans. 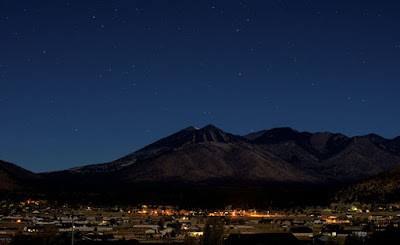 Growing concern about this issue has led to the formation of groups, like the International Dark-Sky Association (known as the IDA and founded in the late 1980s by astronomers) and an increase in regulations/standards for lighting design professionals, like the model lighting ordinance (MLO) that communities can adopt in whole or in part. The MLO was developed by the IDA and the Illuminating Engineering Society of North America (IES). According to the IDA's Technical Director, Pete Strasser, the MLO calls for “light where you need it, when you need it, and no more.” While the MLO has not been widely adopted, it has been incorporated into the LEED credit system. Opponents of these standards argue that the guidelines over simplify the issue and that more study is needed. Read the complete article online and tell us what you think! Also, shout out to fellow IALD experts, James Benya, Nancy Clanton, and Glenn Heinmiller, who are all quoted in the article. A great conversation has started in the lighting design industry about keeping light pollution to a minimum. A recent article by Architectural Record outlines new studies about the effects of night time light pollution, not just on humans, but also on other animals and ecosystems. One study determined that the Milky Way is invisible to more than one-third of the world’s population, including 60 percent of Europeans and nearly 80 percent of North Americans! Growing concern about this issue has led to the formation of groups, like the International Dark-Sky Association (known as the IDA and founded in the late 1980s by astronomers) and an increase in regulations/standards for lighting design professionals, like the model lighting ordinance (MLO) that communities can adopt in whole or in part. The MLO was developed by the IDA and the Illuminating Engineering Society of North America (IES). According to the IDA's Techincal Director, Pete Strasser, the MLO calls for “light where you need it, when you need it, and no more.” While the MLO has not been widely adopted, it has been incorporated into the LEED credit system. Opponents of these standards argue that the guidelines over simplify the issue and that more study is needed. Read the complete article online and tell us what you think! Also, shout out to fellow IALD member, Glenn Heinmiller, who is quoted in the article. Growing concern about this issue has led to the formation of groups, like the International Dark-Sky Association (IDA - founded in the late 1980s by astronomers) and an increase in regulations/standards for lighting design professionals, like the model lighting ordinance (MLO) that communities can adopt in whole or in part. The MLO was developed by the IDA and the Illuminating Engineering Society of North America (IES). According to the IDA's Techincal Director, Pete Strasser, the MLO calls for “light where you need it, when you need it, and no more.” While the MLO has not been widely adopted, it has been incorporated into the LEED credit system. ALD is collaborating with an artist and one of the local universities to integrate lighting into a temporary sculpture on their campus. We recently did a mock up with four different types of lamps. LIVE DESIGN posted a PDF of the lighting rig for the recent Olympic Opening ceremonies in Rio to their website! Check it out if you'd like a peak at what it takes to put on that type of show! 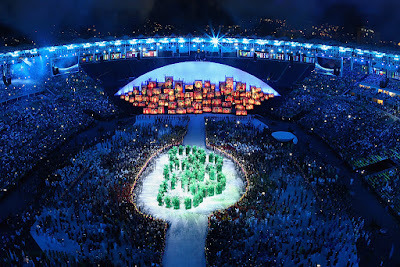 Kudos to the entire lighting team and to all the athletes competing at this year's games. Let's bring home the gold! According to an article in LUX Magazine this month, Pokémon Go tech could revolutionize lighting! 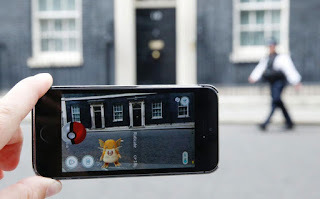 Augmented reality, the technology responsible for the hit Pokémon Go app, is being adapted for use in ceiling luminaires. This technology could allow users to control lighting via hand gestures. Read the article to learn more!! What do you think? Will Pokemon Go make a lasting impression on our world?